We went up into the Smoky Mountains, and Namine became a Junior Ranger. Then we went back to MagiQuest for another round. After breakfast this morning, we drove up into the Smoky Mountains to the visitors’ center. Namine had filled out a Junior Ranger booklet, except for the parts where she’d have to hike on the trails in order to complete. 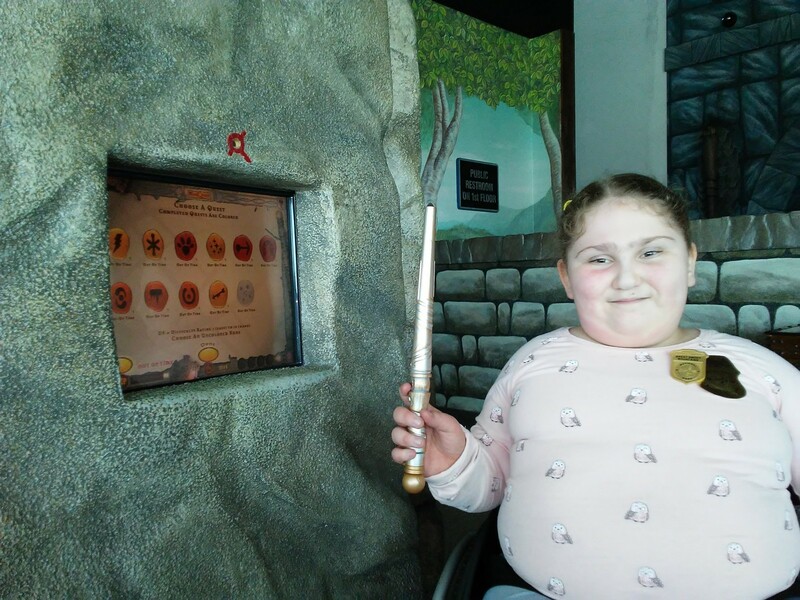 In lieu of that — because the trails are not wheelchair accessible — she was able to fill out a worksheet based on the Smoky Mountain museum located inside the visitors’ center. On the way back to Pigeon Forge, we stopped at an overlook to admire the view. 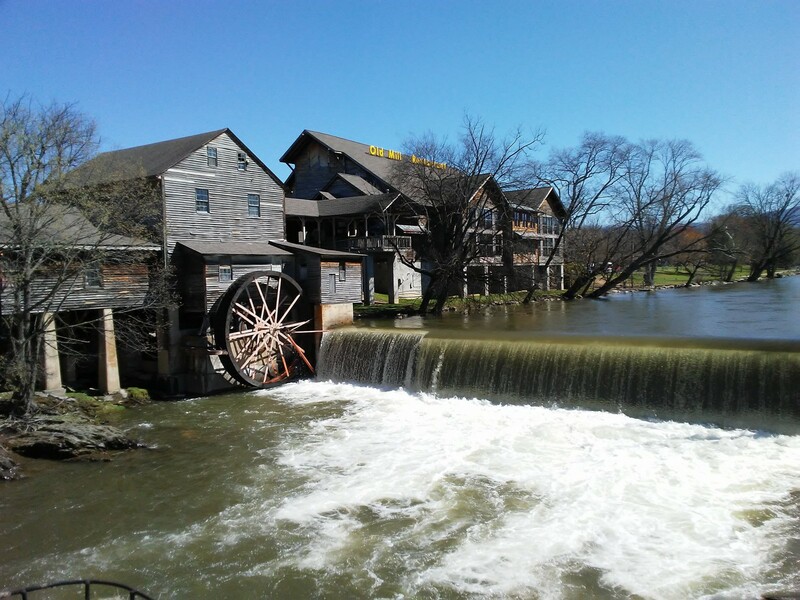 We stopped at the Old Mill in Pigeon Forge for lunch. While we were waiting for our table, Namine and I walked around to look at the waterfall and the water wheel. We made one last stop at MagiQuest. We just had to! Namine had so much fun yesterday, so on our last full day here in Tennessee we decided to give her another hour and a half. During yesterday’s play session at MagiQuest, Namine and I completed three quests. Each one consisted of some problem solving, deduction, and following clues. There was a little bit of a learning curve, so Namine was able to jump right back into it today. By the time our play session ended, she had completed ten out of the eleven total beginner/intermediate quests. Note that I say “she” and not “we” — she did all the work, I just carried the booklet that held the clues for each quest. I was perfectly happy to be, as Namine called me, her “faithful assistant.” (In turn, I called her “loyal magi.”) In her problem solving, Namine was patient and logical. In the times where she got stuck, she’d simply ask me to read her the clue again. I just loved the moment when realization would dawn on her: her face lit up, and she’d exclaim, “I know where that is! Follow me!” And she’d be off like a shot. There was one quest in particular that posed a challenge to her. She had 30 seconds to cross the three realms after she cast a spell on one object, before a new spell had to be cast on another. She wasn’t fast enough on the first try, but she never asked me to push her and run. (I’m sure it occurred to her that it would be faster, with all the times we’ve gone on runs together.) She simply went back and tried it again. I’m sure those sprints in basketball came in handy, because she succeeded in her second try. I loved the look of triumph on her face when she realized she’d done it.